In ‘The Dinosaur Heresies, New Theories Unlocking the Mystery of the Dinosaurs and Their Extinction’ (1986) Dr. Robert T. Bakker opened chapter one with this remark: “I remember the first time the thought struck me! ‘There’s something very wrong with our dinosaurs.’” What followed was a radical new view of dinosaurs, much of which has come to be widely accepted. 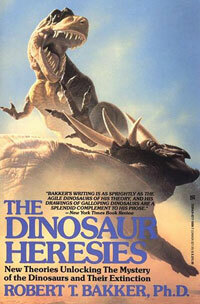 The Dinosaur Heresies book by Dr. Robert Bakker. There is also something very wrong with our pterosaurs. Examining and correcting those errors is the reason for this blog. The living pterosaur experts, for all their learning, skill and experience, have too often held to their traditions and paradigms, rather than testing them. I trust everyone already knows that science is all about testing. Here several problematic paradigms will be examined, tested and the results will be presented. Many prior traditions will have their faults exposed and new, more parsimonious solutions will be recovered. The results presented here have been, and will be, criticized as being “unscientific.” The dictionary defines “scientific” as: “systematic, methodical, organized, well-organized, ordered, orderly, meticulous, rigorous; exact, precise, accurate, mathematical; analytical, rational.” To counter than critical claim, in every test you will be able to clearly see which candidate hypothesis is the more precise and meticulous. Evidence will always trump tradition. Ultimately readers will decide for themselves which side of each argument appears valid. Often evidence will be presented in digital photographs. It’s still the best way to share data. Detractors claim that my research is unsound because I rely on photographs scanned into a computer where I use my flatscreen as a wide-view microscope and tracing instrument. They would prefer that I use a traditional binocular microscope, prism (camera lucida) and pencil to trace fossil elements. Here, several examples will be presented to demonstrate the magnitude gain in recovered data when using the DGS (Digital Graphic Segregation, aka Photoshop) method. Now, admittedly, this gain in recovered data may be due to persistence alone, not the instrument. However, in crushed and scattered fossils, the ability to color-code individual ribs and gastralia to clarify the chaos of a “road-kill” fossil has really helped in several cases. The ability to take those digital tracings and reconstruct the animal has proven to be a boon. The ability to change image contrast to reveal subtle impressions is another strategy that a microscope and pencil cannot duplicate. Here, evidence will be presented in photographs using animation, overlays and any other digital device available. Here you’ll see also several examples of pencil tracings produced from firsthand observations that do not compare well with data recovered using DGS. Let me be clear: Three-dimensional fossils need to be seen first-hand. The DGS method only works with two-dimensional fossils, crushed into a single plane. Evidence will also be presented in reconstructions. Pterosaur workers have been very shy about creating and presenting skeletal reconstructions from the crushed specimens they study and present. However, putting the bones back together turns out to be a very good test to see if left elements match right elements and that all the elements fit together properly and similarly to those of purported sister taxa. They’re also easier to understand. Pterosaur relations (family trees), like those of all other prehistoric and living animals and plants, are recovered using cladistic analysis employing computers to run through huge amounts of data to recover ‘most parsimonious’ results. Unfortunately, pterosaur workers have been very shy about expanding their inclusion list to accept various lizard taxa reported to be pterosaur ancestors, preferring instead to consider and include only those traditional archosaurs that share so few traits. Furthermore tiny pteros have never been included in prior analyses. Here they are. So, why don’t I publish on all these findings? I have. My bibliography is here. Unfortunately, I’ve been blackballed in the last few years. The problem is this: if my hypotheses are right, the present hypotheses (written and supported by living professors) are wrong. The referees for my peer-reviewed submissions are the very people whose hypotheses I dispute. You can see for yourself, it’s not in their best interest to let these papers get published. Beyond mere politics and self-preservation, these professors firmly believe in their hypotheses. Here I’ll show several examples of the twisted logic I have seen as they attempt to support their hypotheses with trumped up evidence, instead of letting the real evidence help create the hypotheses. For your own peace of mind, and to even the academic playing field, remember this: there is no class called Pterosaur 101. This is a subject everyone learns on their own, in the library, online, in the field and in the back halls of great museums. I’m not saying that everything published on pterosaurs is wrong. Far from it. I rely on the literature for my data. I’m not saying that everything I say is right. I’m constantly correcting my own errors. What I am saying is that several current problems in pterosaur studies remain unsolved because alternate, heretical solutions have remained ignored, mocked, untested and suppressed. Enjoy the view — the heretical view (with a tip of the field hat to Dr. Robert Bakker). Final thought: All presented solutions should be tested and tested again. After all, this IS science. This entry was posted in evolution, pterosaur evolution, pterosaur family tree, pterosaur origins, pterosaurs, reptile family tree, reptile origins and tagged evolution, pterosaur evolution, pterosaur family tree, pterosaur origins, pterosaur wings, pterosaurs, reptile family tree, reptile origins by davidpeters1954. Bookmark the permalink.